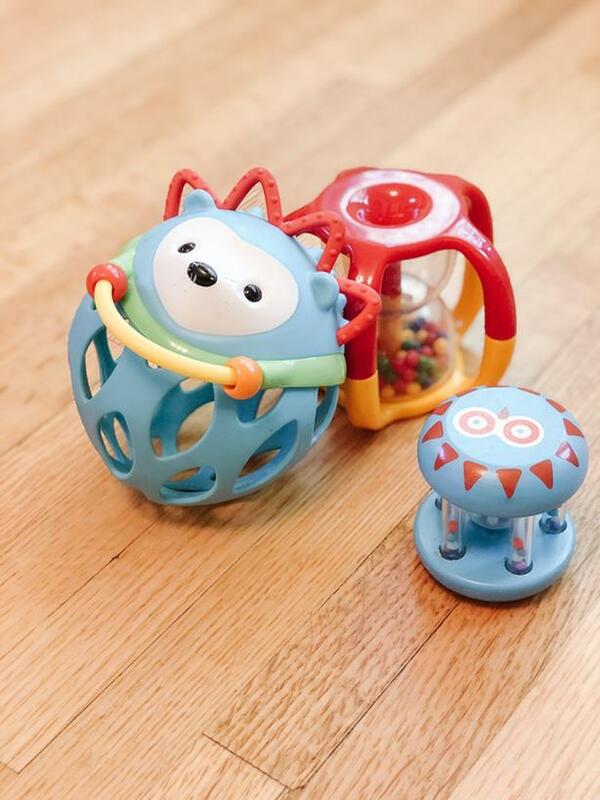 1/ Skip Hop Roll Around Rattle in light blue with beads for teething. Purchased for $13 brand new from Momease Baby Boutique. 2/ A beautiful wooden rattle with small beads that rattle inside a clear ball. Makes a lovely sound. Hand painted. From a trendy boutique toy company. Purchased for $14 brand new. 3/ A colourful, easy to grasp rattle in bright red and yellow from toy company Tolo with beads inside. An award winning toy! Purchased for $15 brand new. All high quality toys in excellent condition, purchased brand new. Check my other listings for lots of other high quality toys and baby gear.